4 D-RING TIE DOWN CHAINS AND BINDERS. 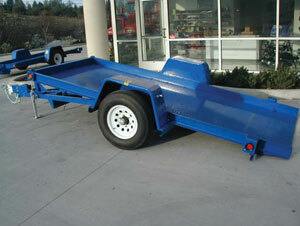 6000 LB GVW 4000LB LOAD CAPACITY. * Please call us for any questions on our trailer flatbed 6 foot x12 foot 6k tilt surge rentals in Portland OR, Gresham OR, Milwaukee OR, and surrounding metro area.